Protons, electrons, neutrons, molar mass, percent composition, ionic...sound familiar? In this unit we'll revisit the basics from first year chemistry. We'll also get reacquainted with laboratory safety and techniques. so what's the BIG idea? Why study chemistry? Hydrates are crystalline substances that contain water chemically bonded in stoichiometric proportions. When hydrates are heated, water is driven off in the form of steam leaving behind an anhydrous ("without water") compound. 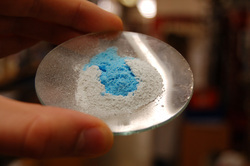 The loss of water usually results in a color change of the compound. If water is added to the anhydrous compound, the color will turn back to that of the hydrate. In this lab, we will heat a hydrate to determine the mass of water driven off. From this we can determine the percentage of water in the hydrate and then the mole ratio of the anhydrous compound to water in the hydrate and thus determining the chemical formula of the hydrate. Click here to download lab. Review Bunsen burner safety and operation. What is the percent composition of zinc in a galvanized washer? Galvanized washers have a coating of zinc to prevent rusting of the iron. Hydrochloric acid reacts readily with zinc. Can you write the balanced chemical equation? What type of reaction occurs? How will you be able to tell when the reaction is complete? What materials are needed to determine the percent composition of zinc in your washer? How many atoms thick is aluminum foil? Provided nothing but a ruler, balance, density of aluminum, and the radius of an aluminum atom, we were able to indirectly measure the thickness of aluminum foil in terms of atoms. How??? With a little bit of Algebra and dimensional analysis. Review class notes here.